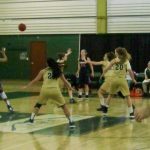 The Lady Barons fell in a tight game against the Medaille Mavericks, 70-58, on Saturday, Jan. 26, at 2 p.m. on Kuzma Court. Franciscan started the game in a bit of hole due to some sharp 3-point shooting from the Mavericks and also because of a 16-5 shooting performance in the first quarter. Despite both of these factors, the Lady Barons escaped the first quarter only trailing 17-12. The second quarter did not look much different as the Mavericks continued their offensive dominance. The Lady Barons did manage to score more in this quarter however, putting up some deep threes from senior guards Reagan Stead and Gaby De Jesus and putting up 16 points total. The Mavericks headed to the locker room at halftime with a lead of 40-28. 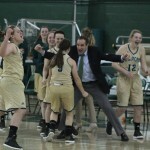 The second half was a different story for the Lady Barons as they managed to score with the white-hot Medaille Mavericks and keep the game within striking distance. The Mavericks only scored 13 points which were all matched by the home teams. The Lady Barons once again kept up with the Mavericks in scoring but couldn’t quite achieve the same defensive results in the fourth. Junior guard Kaitlyn Sonneberger kept her career night going with some tough buckets, and junior guard Abby Baierl played the supporting role nicely the entire game. These efforts were not enough however as the Mavericks continued scoring in the fourth quarter, ending the game with the same deficit as at halftime. The game ended 70-58 Mavericks. Sonneberger finished with a career high 18 points, and freshman forward Grace Godich grabbed a career high 10 rebounds for the home team. During halftime of this game, Franciscan students, alumni and staff alike celebrated the memory of former Baron basketball head coach Hank Kuzma for Kuzma Community Day. He coached at the College of Steubenville when the team was selected as the “Nation’s Best Small College Basketball Team.” Kuzma’s Barons were 95-17 and went on a 47 home winning streak during his tenure. The late coach was honored at center court before the game resumed. The Lady Barons will be back on Kuzma Court to take on Mount Aloysius College on Wednesday, Jan. 30, at 2 p.m.